A view from the Entry Vestibule to the Gallery Foyer and Dining Room beyond of an apartment at One Sutton Place South, Manhattan, with improvements by John Tackett Design. Photo by Jaime Ardiles-Arce for Architectural Digest. ﻿﻿ It is always satisfying to see good architecture hold its value, and that is certainly the case with an apartment in a Manhattan building designed by architect Rosario Candela, 1890-1953. Although some of Candela's commissions were for middle-class buildings, he is now best remembered for his grand apartments that are among the most expensive and sought-after today. No. 1 Sutton Place South was designed by Candela in association with Cross & Cross for Henry Phipps Estates and completed in 1926. 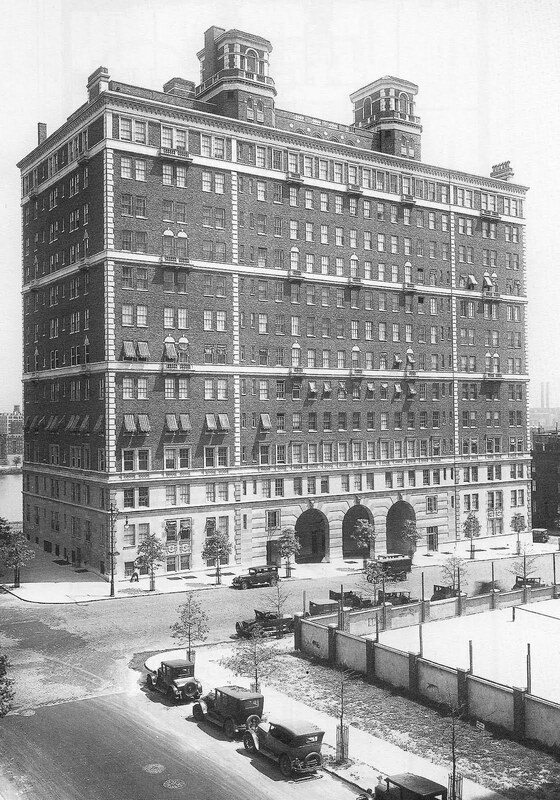 A vintage view of One Sutton Place South, Manhattan. Photo by Wurts Brothers, collection of the Museum of the City of New York. ﻿﻿ The brick, free-standing, apartment building is handsomely embellished with limestone detailing. But the most distinctive exterior feature is a colossal arched, inset porte cochere entrance that allows autos to pull right up to the front door, eliminating the need to cross the sidewalk. For many security-conscious residents, this is a valuable feature. 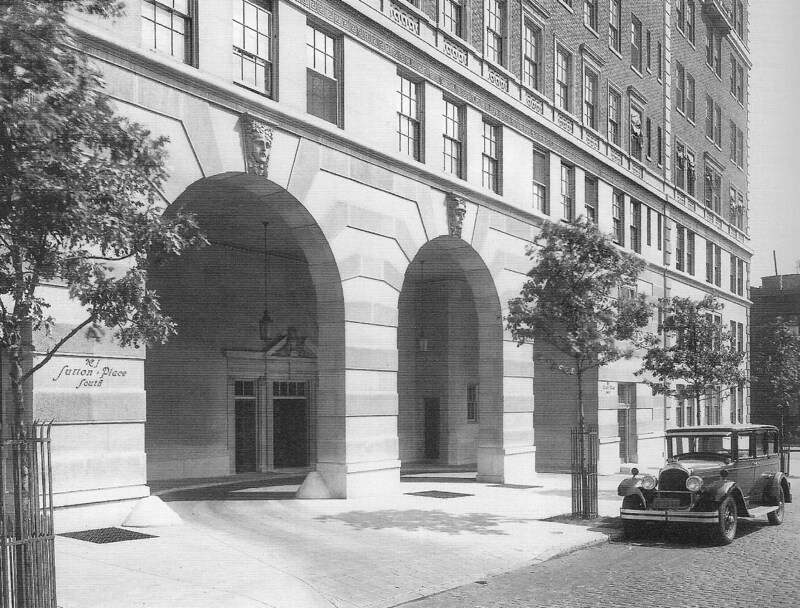 A vintage view of the entrance to One Sutton Place South, Manhattan. Photo by Wurt Brothers, collection of the Museum of the City of New York. 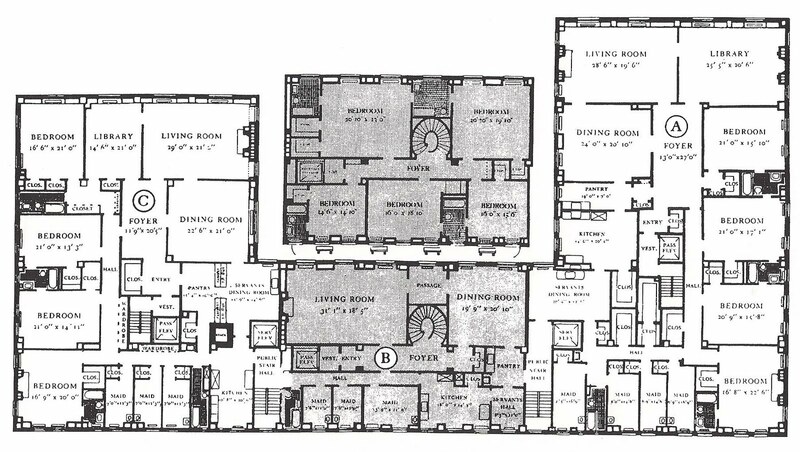 A typical floor plan of One Sutton Place South, Manhattan. Image from THE NEW YORK APARTMENT HOUSES OF ROSARIO CANDELA AND JAMES CARPENTER by Andrew Alpern, Acanthus Press, New York City, 2001. In the original plan, there were 33 apartments of 12 or 13 rooms, both simplex (one floor) and duplex (two floors). When all but crucial construction stopped during World War II and the demand for housing was critical, several apartments were subdivided in 1941 and a few since that date. However, the co-op board no longer allows subdivision. 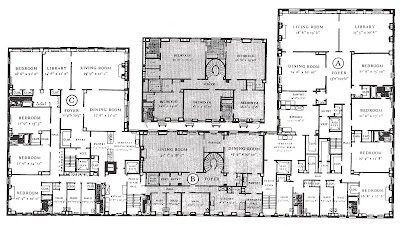 The apartment improved by John Tackett Design is in the "A" line, although the floor plan is altered slightly from the typical floor shown in the image above. A view from the Gallery Foyer in the Library (shown on the original floor plan as a bedroom). 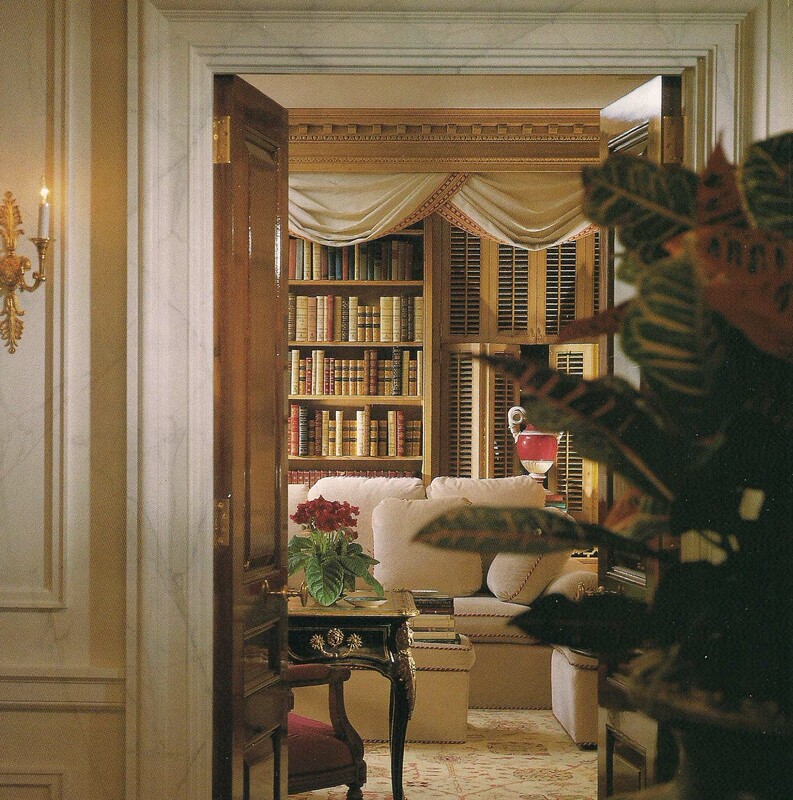 The clients' former Central Park West apartment had been decorated by Tom Britt for the Mister and his wife during a previous marriage. Those furnishings were re-installed in this apartment but the new Lady of the House soon set about changing it to her liking and Britt was no longer actively involved by the time of the John Tackett Design improvements although some decorating vestiges remained. 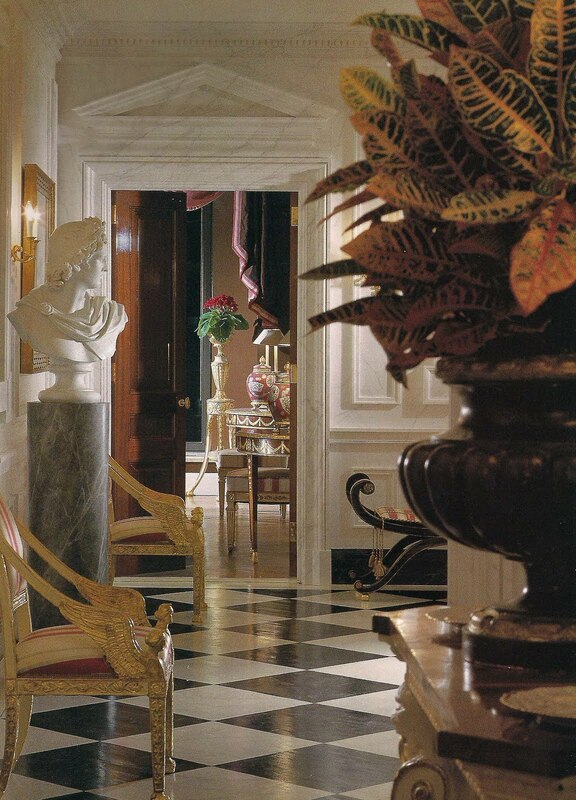 The scope of work for the Foyer involved adding architectural interest while preserving the marbleized painted walls. The addition of mouldings to create a paneled effect provided a route for electrical conduit to be channeled into the masonry walls for sconces on each wall, requiring only the minimum of touch-ups. The existing steel jambs were kept but embellished and pedimented overdoors were added to frame the new mahogany doors. A new plaster cornice was added here and in some other rooms as well. 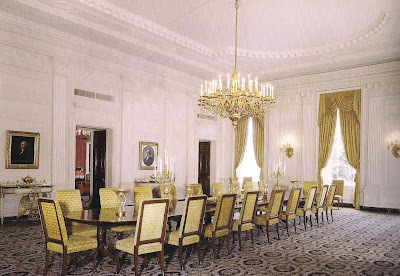 The Dining Room (shown on the original floor plan as the Living Room) with the sideboard similar to ones in the White House. 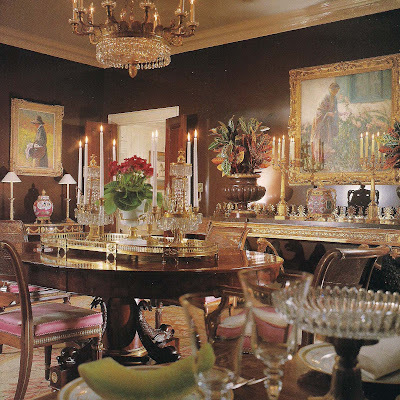 In the Dining Room, the curtains visible in the first photo were destroyed in an accident, leading to the new design by John Tackett that was featured in the March 8, 2011, post of The Devoted Classicist. The sideboard was said to be designed by Stanford White for The White House. 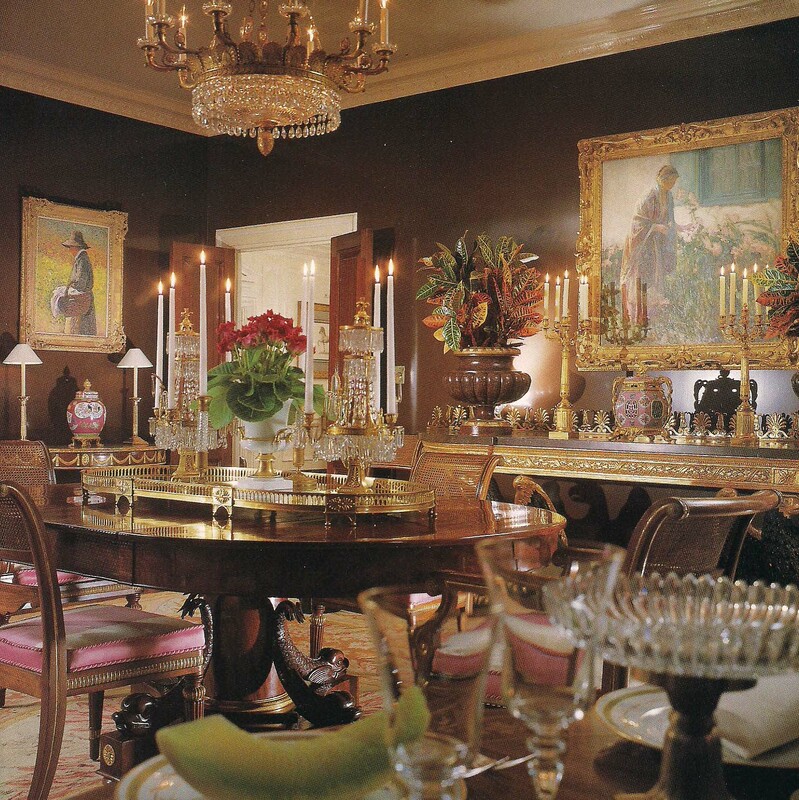 Similarites to those in the State Dining Room can be seen in the image below, painted white and gold by Stephane Boudin of Jansen for his decorating scheme for the Kennedys. The State Dining Room of the White House as decorated by Stephane Boudin of Jansen. Photo from the John Fitzgerald Kennedy Library. 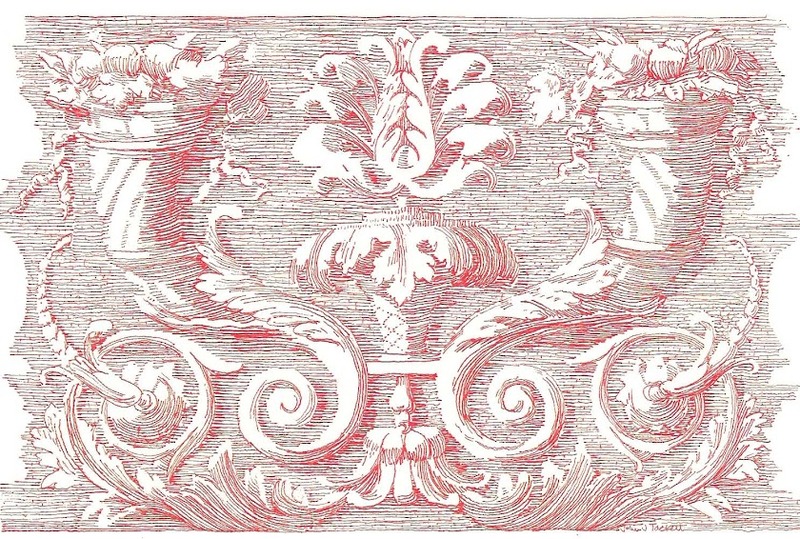 The plaster cornices for the apartment improvements were provided by Hyde Park Mouldings, but all the doors and millwork were custom made to the specifications of John Tackett Design and executed by the general contractor I. Grace Company. The color photographs of the apartment are from the magazine Architectural Digest with subscriptions available here. More about the architect Rosario Candela can be read in THE NEW YORK APARTMENT HOUSES OF ROSARIO CANDELA AND JAMES CARPENTER by Andrew Alpern, Acanthus Press, NYC, 2001, available here. The White House image is from DREAM HOUSE, THE WHITE HOUSE AS AN AMERICAN HOME by Ulysses Grant Dietz and Sam Watters, Acanthus Press, NYC, 2009, available here. More about the decoration of the Kennedy White House can be learned through DESIGNING CAMELOT; THE KENNEDY WHITE HOUSE RESTORATION and JANSEN, both by James Archer Abbott available here. I love how the elemenets in the first photo come together, the classical door pediment, the bust of Apollo and the marble diamond-set tiles. We have been tossing up between tiles square on to our foyer, or at 45 degrees.. I think the diamond-set design just has an edge of elegance. Amazing interiors! L.C., actually the floor is painted wood. Mister's requirements, in addition to the wall finish remaining, was that he would not have to vacate the apartment. That is why the original door steel jambs remained; ripping them out would have created too much dust and would have increased the construction period. So the emphasis was on addition instead of subtraction. Many factors go into the choice of direction of the grid, including an evaluation of the adjoining space as well as the size. To make the pattern fit perfectly with only full or half elements, the angles are not necessarily 90 degrees. Thanks for commenting. What a wonderful insight. I loved perusing the floor plan, and was relieved to see that each apartment had the pre-requisate accommodation for staff. D.T., since this household had only one live-in, a very comfortable, decorated sitting/bedroom with private bath was provided and there was also a room for the day help to change with their own bath. It may be difficult to tell from the floor plan and tight photos, but it is a very gracious apartment layout. Question: Do they have to remove that table plateau in the dining room every time they use it? T.A., although the view is a little foreshortened in the photo, there is actually plenty of room around the plateau for place settings. But it is not permanently on display. Also, there had previously been an extensive reworking of the service area to include a casual family dining area, useful as there was a young child at the time. Gorgeous design. Thank you for the inspirational post! J & G, thank you for your compliment. Aren't there one or two more apartments in this same building you want to talk about? C.A.W., there are. You can look forward to future posts. Thanks for your comment. in the state dining room at the White House. In fact, downright thrilling! T.W., it is difficult to see in the photos, but the one in the apartment has two eagle supports in addition to the legs, while the pair in the White House photo each have a single eagle. I have been to the White House a couple of times, but not since working on this project; it would be interesting to know if there was also a sideboard with double eagles. There is indeed a matching console with double eagle support in the State Dining Room of the White House, in addition to a pair of consoles with single eagle supports. However, the consoles have all been refinished to their natural mahogany, and no longer sport the white/gilded appearance they did during the Kennedy decoration. Thank you for answering that question, A.B. Both the one eagle and the two eagle models are very handsome; my favorite part is the gallery, however, and glad to see it on both of the models. I love most the State dining. It feels like being a Royal for a minute or so. Indeed very well maintained. Keep up the good work. What an amazing story about an incredible building! Thanks for the great history on this! Hope you had a great weekend. L.D., thanks for your comment. E.R., it is a nice layout, with each apartment having it's own elevator entrance. In some other buildings, especially the new ones, it is those banal common hallways that are intolerable. G.A., I am sure there is a tutorial. But perhaps an easier and better way to follow this blog is through FOLLOW BY EMAIL in the right hand margin. I believe I learned to swim there as a little girl. Its always a treat to remember old NY. Kenneth, the penthouse has been remodeled into a modern apartment. It will be the subject of a future post as will another apartment in the building. Thanks for commenting. It is not in a zone marked as likely to require evacuation because of coastal flooding due to a hurricane.